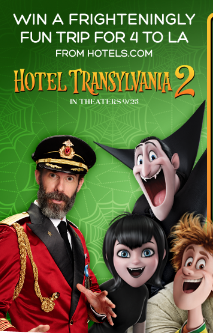 Hotels.com “Hotel Transylvania 2” Sweepstakes – Win a trip to Los Angeles & more! Win a trip to Los Angeles & more! ELIGIBILITY – The Sweepstakes is open only to legal residents of the United States who are at least eighteen (18) years old. SWEEPSTAKES ENTRY PERIOD – The Sweepstakes begins at 12:01 AM CT on September 8, 2015, and ends at 11:59 PM CT on October 31, 2015. PRIZES – One (1) grand prize winner will receive a vacation for the grand prize winner and three (3) guests, provided in the form of one (1) $1,000 Hotels.com gift card for hotel accommodations, one (1) $1,500 pre-paid debit card for airfare, one (1) $500 pre-paid debit card for spending cash and a tour of Sony Pictures Animation Studios. The approximate retail value of the grand prize is $3,000. Twenty (20) first prize winners will each receive a DVD of Hotel Transylvania. The approximate retail value of each first prize is $9.99. The tour of Sony Pictures Animation Studios must be taken on or before October 31, 2016.